As a staunch defender of mock turtlenecks and mock drafts (but not so much mocktails), mock duck has always intrigued me. I've seen it on the menus of Chinese and Thai restaurants, but, to be totally transparent here, I've always been a little scared to ask what mock duck actually is... and maybe I didn't want to find the answer. "Fake" duck seems more like a chicken-in-a-can nightmare than anything I'd want in my Kee Mao. Then, I ordered it by accident, in Thailand, and realized what it definitely wasn't: something to avoid. While it didn't exactly hoodwink me into thinking I was eating duck (much like mock turtlenecks have never tricked anyone into thinking I was wearing a full-blown turtleneck), it did taste... well, good. Like something else, entirely. So I wanted to find out what mock duck is, exactly -- and since you're in here with me, you probably want to find out what mock duck is, too. Let's take this journey together, people! First off, what's mock duck, exactly? When you see mock duck on a menu, it's almost always a wheat-based gluten, soaked in soy sauce, salt, MSG, and various other spices that help give it an approximate duck-ish flavor. Usually, the wheat-based gluten in question will be referred to as seitan. OK -- but, what is seitan? So, you already know that seitan is a wheat-based gluten. The term itself is Japanese, and was popularized about 50 years ago when macrobiotic diets started to gain traction in the United States. But, it has pretty much been a staple of major Southeast Asian diets since the sixth century. Seitan is low in fat, high in protein, and -- when cooked -- has a texture that is remarkably close to meat. 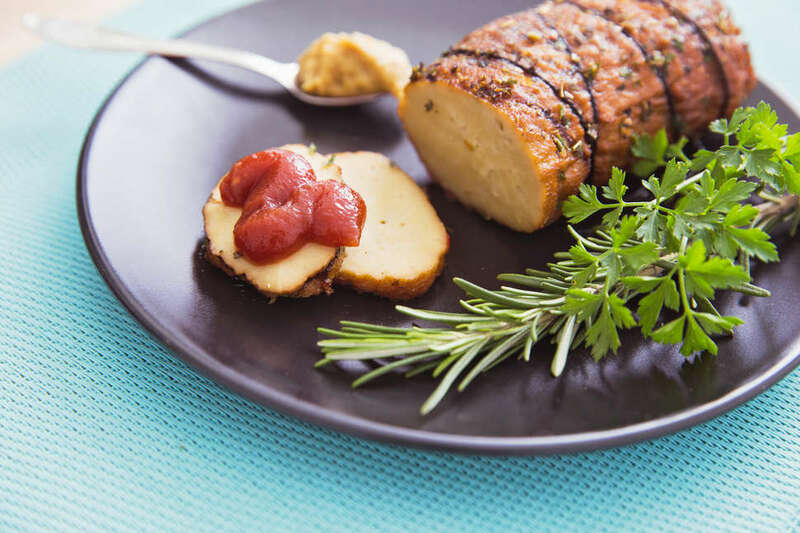 Like tofu, it also tends to readily absorb flavors, so it's fairly easy to create a meat-y approximation with seitan -- in flavor, texture, and protein content. Without flavoring, it tastes like an unseasoned chicken... or maybe a thick portobello mushroom. 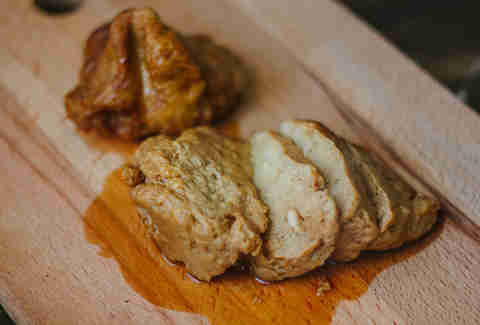 You can totally buy seitan to prepare at home, too. It comes in the raw variety, or pre-flavored. And, some meat substitutes that tote tofu as their main ingredient (like a number of Tofurkey products) actually contain some seitan, too. Basically, seitan is made by repeatedly rinsing wheat dough to remove the starch (best done by hand, by the way), till you're left with a big, sticky pile of pure protein. It's a plant... so... yes. It is also vegan, yes. No, not at all. It's a wheat gluten. It definitely has gluten. In fact, it's gluten-full. Well, the "health" of any food is, really, up for debate -- and anyone can cherrypick any number of studies to declare certain foods to be "good for you," or not. But here are the facts: Seitan has just about the same level of protein as animal meat, it's low in carbs, and is low in fats. You can also season it however you'd like. So, for the most part, you can probably consider it "healthy." Especially when compared to real duck. What's the difference between seitan and tofu? Or seitan and tempeh? Well, they are all pretty much different things. Tofu is made of condensed soy milk, mixed with nigari. Tempeh is made by fermenting soy beans in banana leaves. The only thing they really have in common is that they're commonly used as meat substitutes, they've been consumed all over the world for literal centuries, and they have a sponge-like ability to absorb flavors. So, should I try seitan? Yes, you really should. As stated before, it's literally been a staple in some of the most culinary rich cultures in the world for hundreds of years, it's generally healthy, and you can pretty much prepare it any way you'd like. So try it. And instead of trying to treat it like a vegetarian duck, treat it likes its own beast: a protein-rich plant product that can stand on its own. Especially in a plate of noodles.